Sharks! They can be so fascinating and just a bit scary as well. 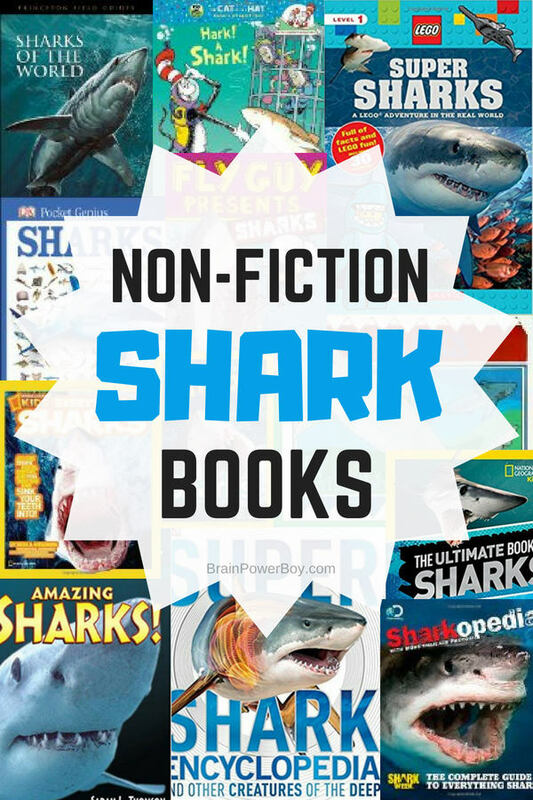 We found some great non-fiction shark books. I was thinking back to when my son was really into sharks and we went digging to see which books were the best books for boys right now. Some of the ones he read earlier still made the list which didn’t surprise me too much. We love finding good books. But, there were some new ones that we just had to add in as well. These books are great for shark fans young and old. I know we are pulling ours out for shark week for sure! 1. When starting out on any new subject I like to see if Gail Gibbons has written a book on it. If so, that is the one I grab. Sharks is an awesome place to start to get some solid information. 2. If you have a young LEGO fan and have not seen the new series of non-fiction LEGO science books, you need to check it out! They happen to have one on sharks called Super Sharks (lucky us!) so I am including it here. It is a level 1 reader. They will learn about sharks and get building ideas as well! 3. Hark! A Shark! is an installment in the Cat in the Hat Learning Library series. We have read a few of these and while the rhymes certainly don’t do justice to Dr. Seuss, the books do provide a lot of good info in an easy to read package. 4. This level 2 National Geographic Readers: Sharks! book is nice for young boys who want to read on their own. There is not a ton of info here as it is rather short but it does give some interesting facts and as with most NG books the images rock. 5. Another level 2 choice is Amazing Sharks and while for young readers, it is pretty darn interesting. For example, did you know there are sharks that glow in the dark? Cool, right? 7. The books in this series are amusing and informative. Boys really seem to like them a LOT. Fly Guy Presents: Sharks. I would say it is for up to 3rd or 4th grade. 8. If you are looking for a very good field guide on sharks get this: Sharks of the World . It is an illustrated guide (no photographs) and has 440+ different shark species represented. I had no clue there were so many! Field guides are wonderful books to have on hand and I highly recommend investing in a few on topics your boys are interested in. 9. We often like encyclopedic style books and Sharkopedia: The Complete Guide to Everything Shark is no exception. Great for older boys it had a lot of info packed into it as well as color photos that get you close up and personal with sharks. Super book. 10. National Geographic Kids Everything Sharks has it all. Great images, bite-size (sorry – couldn’t resist) information and writing that will appeal to boys. Shark fans won’t be able to put this title down. Recommended. 11. Another National Geographic Kids book is The Ultimate Book of Sharks. It covers sharks from the very smallest dogfish to the incredibly powerful great white shark. It is a very visually appealing book. 12. Another excellent book comes from DK. The Super Shark Encyclopedia is very, very good. It includes cross-sections and strip layers (which we think your boys will love). These allow you to basically see inside the sharks. With awesome photos and a lot of intriguing information we give this book our Highly Recommended label. Fiction Shark Books Young Shark Fans Must See! which is great collection of shark books from board book up to beginning chapter books. Shark Activities That Will Blow You Out of the Water. Combining activities and reading on a topic is a great way to have the learning stick. And, you don’t want to miss Educational Shark Toys for Learning About Sharks because these toys are super engaging and . . . a whole lot of fun! Another great list from this site! My kids love non fiction books. I can’t wait to order a couple of these before our next beach trip! Aw Marie, that is so sweet. Reading shark books at the beach – hmm . . . might be too scary for me even though I know more about them now. Sharks are most definitely scary – but they’re also pretty amazing too so thanks for pulling together such a great list to help us learn more about them. No problem Clare! We found out a lot about them. They are actually not as dangerous as the movies make them out to be.